Custom seat covers are made using a specific pattern (measurements) for your vehicle. They are made to fit exactly and allow for all original seat functions like moving, folding, split seats, sport seats, Isofix openings, Airbags, etc. Does this seat cover pack contain both front and rear seat covers? The set will contain both front and rear seat covers. My vehicle isn’t listed on your Website? No problem, simply call us on 033 345 3875, or send us an email to sales@kindo.co.za and one of our customer-service representatives will assist you. I have this year’s latest model – do you have the pattern for this vehicle? If your vehicle is new and we do not have the pattern then contact us and we will find the vehicle and make the covers to fit. Can I still install a set on a seat with airbags? 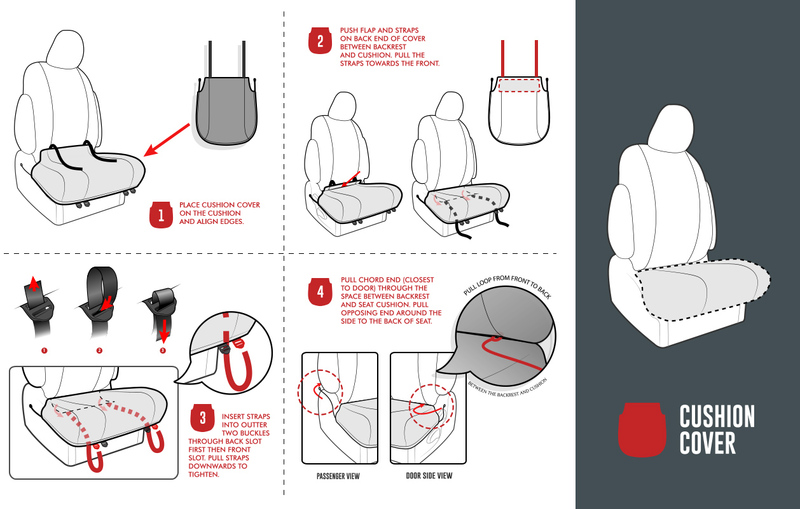 A special seam is built into KINDO Seat Covers to protect you without your intervention and on demand. The force that is created, as the airbag quickly inflates, applies pressure against this section of seams which have been engineered to snap and tear apart. This is a “seamless” integration that doesn’t compromise the fit, look or durability. Indication that accommodations are present will be an airbag tag. Are your seat covers machine washable? A simple wipe down is all that is required. We have over 450 unique custom designs to ensure that your covers will fit. Do I need to remove my original interior to put these covers on? Absolutely not. These covers slip over your existing seats and, as they are custom made, will fit perfectly. Do I need tools to install these covers? Only 2 of our 478 patterns require a 12mm spanner to assist with the fitment of the seat covers. Should you experience any difficulties please contact us on 033 345 3875 for assistance. There are creases in my seat covers when I first fit them to my car, will they go away? Creases will be present on most seat covers whether store purchased or online due to the need to fold the seat covers. Once seat covers are fitted for a few weeks the creases will disappear. How are direct orders delivered? All orders within South Africa will be delivered by Courier. You will be sent a tracking number to be able to track your parcel. Delivery Costs: R 150.00 excl. within S.A. Quantities ( sets ) of 4 or more qualify for free delivery. We try to carry stock of all the popular models of vehicles, so delivery ex factory is 1 to 2 working days. Should your ordered product not be in stock, but of which we have a pattern for, the delivery will be 3 to 4 working days. Delivery of large fleets will naturally need to be advised on placement of the order. What is the warranty on your covers? We offer a two-year warranty on all our KINDO Seat Covers regardless of the industry or clients operating environment.